By Allan WoodsIt has charted the world's highest peaks, the ocean floor, the Amazon rainforest and even provided a glimpse into the hermit state of North Korea. But Google's mission to map the world has largely steered clear of the inhospitable Arctic. Now, however, the search-engine firm is embarking on what might be the most significant update to centuries of polar cartography–and one it hopes will foster a better understanding of life on the permafrost for millions of web users. Google has flown a small team to Iqaluit, the largest town in the Canadian territory of Nunavut, armed with their warmest winter gear, a stack of laptop computers and a 18kg (40lb) backpack-mounted telescopic camera. The town of 7,000 people will go on display via Google's popular Street View application in July.Comment: For more on Google Maps, see Google Maps in Cheorkee and Unidentified Reservations in Google Maps. 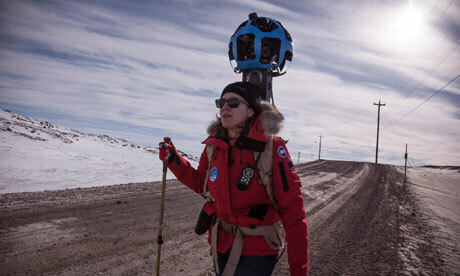 Below: "Google Street View's Karin Tuxen-Bettman treks across the Arctic tundra in Iqaluit." Indians have actually been employing Google Earth for a lot of things. In the Amazon, they're using satellite technology to spot trespassers.